Making this couldn't be easier. I start with equal parts uncooked quinoa and old-fashioned rolled oats, then add nuts and dried fruit. Here I used dried cranberries, coconut flakes, almonds, and pumpkins seeds. Some other possibilities: dried cherries, blueberries, apricots, mango, pecans, cashews, walnuts. You can also add it some flax seeds or chia seeds. Then, just stir in melted coconut oil and agave nectar or honey until everything is evenly mixed. A wonderful side benefit is that if you live in a small apartment, the lovely coconut aroma from the baking will stay around for the rest of the day. Not a bad thing at all. I like to eat this with Greek yogurt or almond milk, but it's also great on its own as an afternoon snack. This granola keeps for about a few weeks if you store it in a cool, dry spot in a tightly sealed glass jar. That is, if you don't stand at your kitchen counter while the granola is still cooling and keep eating it by the spoonful. Which requires a good amount of willpower to avoid. 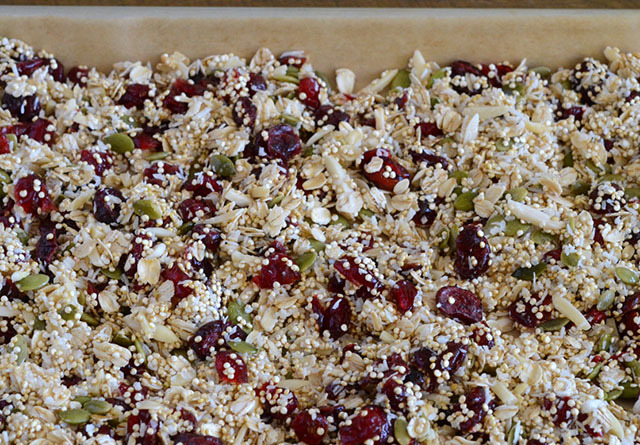 In a large bowl, mix together the quinoa, oats, cranberries, almonds, pumpkin seeds, and coconut flakes. Stir in the coconut oil and agave nectar and mix until all the dry ingredients are evenly coated. Spread the mixture out on a thin layer on large baking pan lined with parchment paper. Bake for 25 to 30 minutes, stirring once about halfway through, until the granola is golden. Remove from the oven and cool to room temperature before transferring to your storage containers.